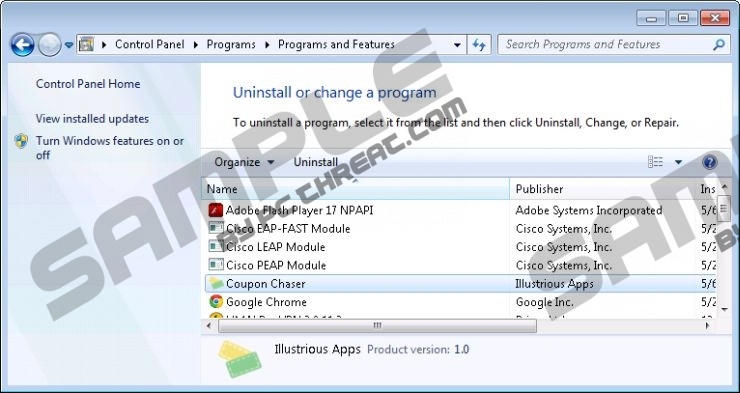 Coupon Chaser has been classified as an adware type application that features numerous malicious traits. From the very outset we recommend that you remove this infection from your computer. However, we will discuss this infection in greater detail throughout this article. In a nutshell, the program is malicious due to the fact that the advertisements promoted by it are dangerous and pose a threat to your system’s security. Therefore, we are of the opinion that it would be in your best interest to remove this infection as soon as possible. You should be aware that the developers of Coupon Chaser do not check whether the content promoted via their product is legitimate. Therefore, dishonest advertisers tend to use adware to promote misleading and oftentimes fake advertisements. The application has the ability to collect information about the user’s browsing habits by collecting information, such as search queries and browsing history. The information is then sent back to the advertisers for analysis so that they could make changes to their advertisement campaigns and even tailor specific ads to a unique user to increase the chance of a click. We are of the opinion that that is a violation of personal privacy and that is one of the reasons why you ought to remove this infection. Given the fact that the developers of Coupon Chaser to not endorse the content their program promotes it is reasonable to assume that various scammers and cyber criminals could also use their services to promote fictitious advertisements that can redirect you to infected websites. Such websites could contain links to malware downloads. Indeed, your computer might be infected with ransomware, rootkits, rogue applications, and other malicious programs. So there is no reason for Coupon Chaser to remain on your PC, because its presence might inflict disastrous consequences. The infection itself has a dedicated website at Coupon-chaser.com, but at the time of this article the download button did not work. But nonetheless, the infection is still being distributed using other means. Our research suggests that the application might be bundled with other software. All in all, Coupon Chaser is bad news. The infection collects information about the user and sends it back to whoever is using their advertising services. It is likely that cyber criminals might use it to promote fake ads featuring malware downloads which would cause you a lot of problems, since serious infections are impossible to remove manually. Therefore, we recommend using our manual removal guide to remove Coupon Chaser from your PC, before far more serious infections enter it. Navigate the mouse cursor to the bottom right corner of the screen. Navigate the mouse to the bottom left corner of the screen. Press Alt+T and open Internet Options. Press Alt+H and select Troubleshooting Information. In the dialog box, click Refresh Firefox again. Quick & tested solution for Coupon Chaser removal.